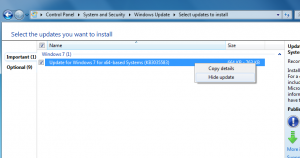 Find Update For Microsoft Windows (KB3035583) and uninstall it. After the reboot, launch Windows Update. 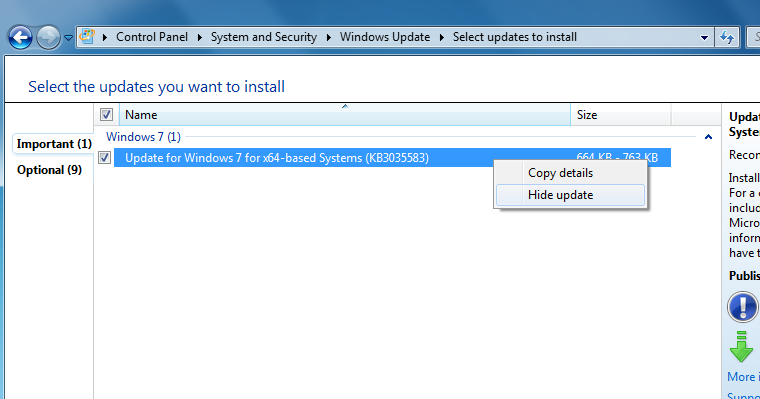 You will see it listed under Important Updates ready to be reinstalled. Simply right click it and choose Hide Update. This morning Amazon announced the Fire TV set-top box and I’ve already ordered one. At $99 it’s not a huge investment, and I’m very curious if something is capable of taking over the Apple TV in my household, which I use daily and like a great deal. My biggest complaint against the Apple TV is that it doesn’t support Amazon Prime content. Well, the Fire TV supports Amazon Prime content obviously, as well as pretty much everything else I use the Apple TV for. The big question will be what it does for local content. Right now the Apple TV connects to iTunes that I have running on a computer and where I keep all my ripped DVD’s and digitally purchased content. As well as a few video podcasts I watch. It does look like the Fire TV will work with Plex, so I may have to investigate that option. That’s all I got on it for now. Should be here in a couple of days and I will report again as I mess around with it. I’ve done it, I’ve gone and ordered an Android based phone. A Nexus 5 to be specific. I have 2 driving reason for this major decision. A) I feel Apple missed the boat by not releasing a larger screen iphone last year. (I want a slightly bigger screen). And B), I really want to move from my $100+/month verizon plan to something way more affordable. So, with this one purchase, I’m satisfying both needs. I’m no Apple lover, but the iphone is where I started in the real smartphone world and am completely comfortable in it. Frankly, and this may come as a shock to you, but the Apple ecosystem works very well for me and my household. I use itunes as my media library, and own an iphone, 2 ipads, and 2 Apple TV’s. Plus my kids all have 4th gen ipods. Also the 2 AV recievers in my house support Airplay, and I use that feature A LOT! The way everything works together is quite impressive. I know there is a ton of itunes hate out there, but it works really well for me and has for years. Odds are pretty good that Apple will release a larger iphone this year, but here’s the thing, It won’t be available on the alternate carriers right away (if at all). So if want a large screen now and want to pay less for service, Android is my only real option. I have tons to say on this subject but don’t want this to be a ridiculously long post, so be sure to check back for more as this new chapter begins. The other day I got a call from someone with a non booting computer. User was concerned because of course, they didn’t have a recent backup of the main application they use to run their business. Since I knew there was critical data, my first process before troubleshooting the issue is to pull the drive and hook it up to the bench computer in my shop and attempt data access. I was able to access the drive without issue and quickly backed up the application data. Once I had that, I used Storagecraft ShadowProtect to create a full image backup of the drive. Then I placed the drive back in the computer and powered it up to see what I got. I was quickly presented with a ‘Missing operating system’ message and that’s it. I then booted to an XP CD in repair mode and ran FIXMBR (which didn’t work), then also ran a CHKDSK (also which didn’t help). On a whim, from my bench computer I attempted a virtual boot of the backup image I had created earlier. Much to my surprise, Windows booted to the login screen. Interesting. I couldn’t log in though because of activation issues (Thanks Microsoft). But based on that successful boot up I wanted to try something. I grabbed an old hard drive that I had laying around and performed a restoration of the image to that drive. I did choose to install a new MBR though. 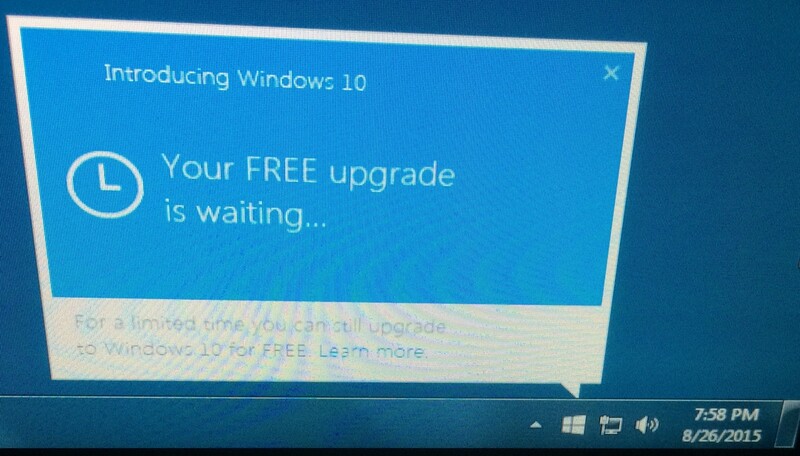 Once completed, I hooked that drive up the computer, and to an even bigger surprise, Windows completed booted up AND allowed me to log in. With the machine looking to me as if it is running again, I had the customer come in and verify everything worked. He was ecstatic when he saw all his data in the app. ShadowProtect from Storagecraft is an awesome program for backups. I use it in my office and at many clients to backup critical systems and servers. It’s saved the day more than once. Would you like to learn more about backing up your computer systems with ShadowProtect? Please contact me at Badger IT Solutions, LLC and we can discuss backup strategies for your personal and business computer systems. If you’re like me and hate the U3 ‘feature’ of some modern USB drives, simply uninstall it. I’ve been wanting to remove it for quite awhile, but have never researched how to do it, that is until today. And it was surprisingly easy. Just visit http://u3.com/uninstall/ and follow the prompts to download the uninstaller. You will lose all data on the drive in this process so make sure to back up anything important. Also, I’m guessing this is a Windows only option. I don’t know what Mac or Linux users are suppose to do. If you do, please share in the comments.